Posh striker Tom Nichols stretches to reach a cross in the 2-0 win over Notts County. Photo: David Lowndes. Peterborough United manager Grant McCann won’t accept any dropping of standards before the third round FA Cup tie with Chelsea at Stamford Bridge on Sunday, January 8. Posh secured their dream tie with the Premier League leaders with an ultimately comfortable 2-0 win over Notts County in a second round replay at the ABAX Stadium tonight (December 20). Paul Taylor scores the second Posh goal against Notts County. Photo: David Lowndes. Goals in the first eight minutes from midfielder Gwion Edwards - his fourth in four games - and Paul Taylor settled the outcome of a competitive game. Posh ‘keeper Luke McGee saved a penalty later in the first half. But McCann pointed out Posh have three important League One matches before their big day out in London. Posh host Gillingham (December 26) and Coventry (December 31) before travelling to league leaders Scunthorpe on January 2. McCann said: “The only three people definitely going to Chelsea are me, Lee Glover (assistant manager) and the coach driver! “One of the pleasing aspects from tonight was the reaction of the players after the game. They were calm. No-one was bouncing off the walls or getting too excited. There was satisfaction at a job well done, but everyone in our dressing room knows how important the league is to this club. We want to go to Chelsea in as good a league position as we possibly can. Ryan Tafazolli of Posh battles with Notts County's Jon Stead. Photo: David Lowndes. “Our priority for now is getting some recovery work into the players before a very tough game on Boxing Day. “We delivered a solid performance against County. It was a tough game for us because everyone expected us to win, but we coped with those expectations very well. “Obviously we enjoyed a great start and we finished very well also. We could have nicked a couple more goals on the break. “Because of the way we play it’s difficult to sustain pressure for 90 minutes. We press high and we all work hard. Luke’s penalty save was obviously very important, but in the end we managed the game very well. Posh midfielder Gwion Edwards shoots at the Notts County goal. Photo: David Lowndes. “Even in our quite spells I was never too concerned on the sidelines as I know how well my back four and goalkeeper are playing. “I’m pleased for the fans as much as anything as they deserve a big day out. We haven’t played one of the really big clubs in my time here so it’s something to look forward to. Taylor limped out of today’s game with a hamstring problem, but Posh hope they took him off before too much damage was done. 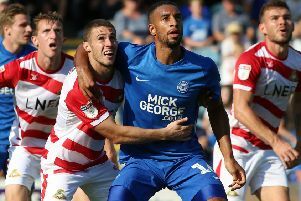 Marcus Maddison should be fit enough to return and striker Lee Angol is now free from suspension.